SANTA RITA, Guam - The amphibious transport dock ship USS San Diego (LPD 22) and embarked 15th Marine Expeditionary Unit (MEU) arrived in Guam for a scheduled port visit Jan. 9. Naval Base Guam is a strategic U.S. naval base located on Apra Harbor, Guam. It serves as one of the leading naval bases in the Indo-Asia-Pacific region. "It feels good to be making our way home," said Quartermaster 1st Class Christian Roman. "It's strange to think that this is the first U.S. (territory) port we have stopped in since we left San Diego." San Diego's port visit will allow the crew the chance to conduct some maintenance, onload supplies and mail, as well as relax and enjoy the local scenery. "Stopping in Guam will be a great time to replenish what we need," said Logistics Specialist 2nd Class John Munyan. "There's a lot of mail and items that we have not received since most of it was redirected once we left the Mediterranean." After completing their maintenance, Sailors and Marines aboard San Diego plan on using this time to relax and enjoy the island. "I know Guam is not a very big island but I'd like to see what is around and look at some of the history since a lot of my friends and their families are from there," said Quartermaster Seaman Joriane Leyran. "I've heard Guam is a beautiful place and I'm excited to be going there." The Morale, Welfare and Recreation (MWR) in Guam is also hosting tours such as a dolphin watching, snorkeling, fishing, seeing local aquatic and terrestrial wildlife along the Talofofo and Ugum Rivers, or an island tour to observe some of Guam's cultural and historical spots. "I know Guam has very nice and clear water with tons of wildlife," said Marine Lance Cpl Ty Dowdy. "I've never been snorkeling in another country so I think this will be a lot of fun." 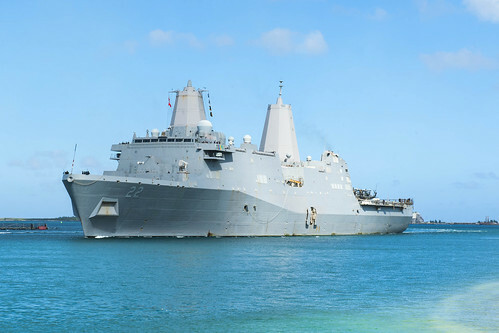 While in Guam, San Diego will be rejoining with the amphibious assault ship, and flagship of the America Amphibious Ready Group, USS America (LHA 6) who is also visiting the island. "It's good to get the band back together and merge the collective combat power to form the synergy that is the ARG/MEU team," said Capt. Pete Collins, commanding officer of San Diego. "As individual units, each ship has its own significant presence, but the combined force is where the full combat power of the ARG/MEU team comes into play." After visiting Guam, San Diego will continue on her scheduled deployment as part of the America ARG. San Diego, with embarked 15th Marine Expeditionary Unit, is operating in the Indo-Asia Pacific region to strengthen partnerships and serve as a ready-response force for any type of contingency. Seventh Fleet, which celebrates its 75th year in 2018, spans more than 124 million square kilometers, stretching from the International Date Line to the India/Pakistan border; and from the Kuril Islands in the North to the Antarctic in the South. Seventh Fleet's area of operation encompasses 36 maritime countries and 50 percent of the world's population with between 50-70 U.S. ships and submarines, 140 aircraft, and approximately 20,000 Sailors in the 7th Fleet.